A sequence in which the audience is shown what's going on in someone's imagination instead of things that are actually happening. This may be clear from the beginning, or it may be made to look real at first. Similar to a Dream Sequence, but daydreaming or similar instead of actual dreams. Sometimes several characters can have a shared Fantasy Sequence. One can also be used to represent imaginary events being narrated in the story's real world. Acting Out a Daydream: Where someone almost forgets their fantasy sequence isn't real and starts acting it out. Daydream Surprise: Where it looks real at first. Indulgent Fantasy Segue: Someone responds with violence, but it turns out they were only imagining it. Deep-Immersion Gaming: Characters are so immersed in a game it's shown as their being inside it. RPG Episode: An episode dedicated to the above. Fantasy Twist: An unexpectedly mundane or unpleasant one. If I Were a Rich Man: Fantasizing about being rich. Imagine Spot: A brief cut to a situation-relevant Fantasy Sequence and back. Power Fantasy: Fantasizing about being powerful and taking revenge. Imagine Spotting: Where someone else can inexplicably see it. Mr. Imagination does these a lot. Chuunibyou is this especifically for teenagers. This trope caused the Mundane Made Awesome in the Love, Chunibyo & Other Delusions anime. Such sequences are out of the fantasies of several Misses Imaginations. Used frequently in The Tale of One Bad Rat, especially in the first half. Helen imagines herself committing suicide several times, or interprets other characters and scenes as fable animals or beings from other times. Used in in every issue of the2015 Jughead series to tell short stories. One of the foremost elements of Calvin and Hobbes. Calvin is constantly living in his own world(s), but the use of this trope is actually pretty complicated. In summary, there are a lot of clear-cut fantasy sequences and also a lot of deliberately ambiguous scenes. In the clear-cut cases, Calvin imagines riding dinosaurs or being a heroic space pilot (or an endless number of other things), and it can typically be clearly seen that the real world exists around him as he imagines things. Even Hobbes doesn't see these as real. For whatever reason, he also almost never appears in them, absolutely never as himself, whereas other characters may appear as aliens or something else. But then there are the events where Hobbes is present as a real if somewhat anthropomorphic tiger, and these also involve fantastic things like time travel or aliens. Hobbes turns into a toy tiger when adults or even other children are present, but by Word of God (in the anniversary book) neither the idea that Hobbes is Calvin's imagination or that he's real is more true than the other. 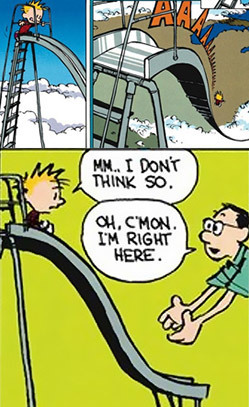 Sometimes others also can't see things that are real to Calvin and Hobbes, such as Calvin having turned into an owl, but usually these are also left ambiguous, like Calvin's clones of himself just never happening to show themselves to his parents more than one at a time, or the question of how Calvin managed to tie himself to a chair if Hobbes didn't do it. In Unfaithfully Yours, Alfred gets three of them, set to three different pieces of music he's conducting. However, it doesn't go quite so smoothly when he tries to carry these fantasies out in reality. A Gunfight ends with an extended fantasy sequence showing what might have happened if Tenneray had won the gunfight instead of Cross. It is left as exercise for the viewer if this is occurring in Cross's imagination or Nora's. In Wolf Hall, Thomas Cromwell constructs rather elaborate scenes in his head, possibly related to his memory system, to plot out his next move. He sometimes imagines his mentor Cardinal Wolsey in the room with him, and twice populates an imaginary banquet with various characters as the tides of power in Henry's court shift, with the Boleyns as the main course. In a less ominous sequence, when he meets the (probable) widow Helen Barre, he mentally replaces her tatty and worn clothing with a very specific outfit, priced by the yard, that would highlight her beauty. The last episode Cosmos: A Spacetime Odyssey has a Call-Back to the first when part of Neil's recap of scientific history includes Giordano Bruno, locked up by the Inquisition, "escaping" his cell into the dream of an infinite cosmos. Extremely common in Hannibal, between Will Graham's hallucinations and various characters' memory palace sequences. In the song "Off to the Henhouse" from Episode Three of Of Weasels And Chickens, Prima the weasel enters three of these. In the first one, she is surrounded by pastel watercolor paper cutouts of chickens and the henhouse. In the second, she has chicken backup dancers and dons a silver top hat, sparkly vest, and a cane. In the third, she is surrounded by neon paper cutouts against a black and silver backdrop. Good Guy Comic gives us our main character, Guy, who has at least two of these. In Storywisher there's an example on the very first page, with Fi being chased by a giant green monster that turns out to be a cuddly toy in real life. In "The Ticket Master", each of Twilight Sparkle's five friends who want her extra ticket to the Grand Galloping Gala imagine, and we are shown, what they would do there. (Make a lot of sales, meet her idols, party like mad, meet the stallion of her dreams, see the exotic plants and animals in the garden.) In "The Best Night Ever", during the song near the beginning, these are recapped with new sequences with the same content, as well as one for Twilight herself. In "MMMystery on the Friendship Express", we're shown various crazy explanations Pinkie Pie imagines about who did the crime and how, each of them parodying some work or genre. The New Adventures of Winnie the Pooh: In "Paw and Order", the whole Wild West play the characters are doing turns from a small stage with a few actors into a collective fantasy sequence with several sets, tons of extras who don't have any known actors, and a villain who doesn't either but who still manages to be so willful as to defy the script. This is the point of the Magnificent Muttley shorts on Dastardly and Muttley in Their Flying Machines. Doug: was loaded with fantasy sequences - usually Doug imagining exaggerated best and worse case scenarios for an action he may take, or a problem he faces. From A to Z-Z-Z-Z: Ralph daydreams that he can fly, that he battles numbers, that he is a cowboy working for the Pony Express, that he is a sea captain bringing a submarine back to the surface, that he is a boxer and that he is Douglas MacArthur. Steven Universe: Most of the episode "Garnet's Universe" is Steven imagining what Garnet does when she's on a solo mission. It seems to involve talking animals and an extended parody of shonen anime.